Word of mouth works well in the case of feeding the mouth. After hearing praises for a food from a friend, you really want to give it a shot. My friend and colleague Jess has been praising about this new frozen yogurt place that serves by weight near DC’s Chinatown for couple of weeks. One evening after dinner, my cousin M’deep and I were looking for a light and relatively healthy dessert. Jess’s frozen yogurt seemed to fit the bill. At first, we couldn’t find the place because it’s not right in the Chinatown but on F and between 10th and 11th street, which is technically Metro Center downtown. 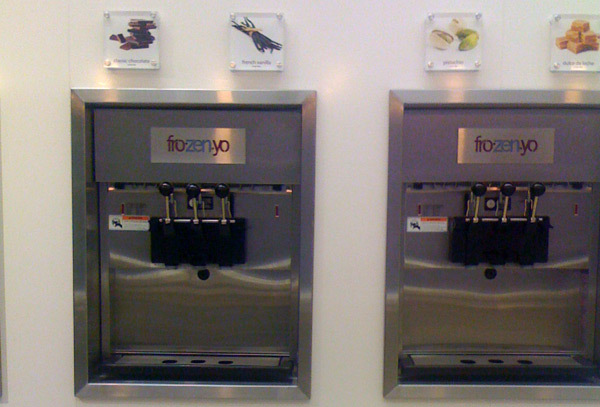 FroZenYo is self-serve À la carte format frozen yogurt place with choice of 16 rotating flavors dispensed through self-serve soft serve machines. 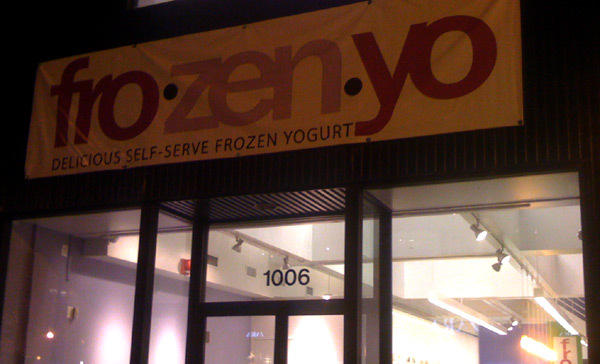 FroZenYo charges 39 cents per ounce for any yogurts with any number of toppings. At first, it seems very cheap, but it comes out to be $6.24 per pound and in my experience, the average cost comes down to around $4. The best thing is you have the complete control over what and how much you choose. Unless you work with soft serve machine, only other place you get to operate a soft serve ice cream machine is at Chinese buffets. I always look forward to pulling down the lever serve machine whenever I go to any Chinese buffet. It must be some sort of primal circuit in our animal brain that gets joy out of pulling a lever for coins or food. My first rendezvous with soft serve ice cream began with McDonald’s version of vanilla soft serve ice cream, which is just 150 calories and about a buck. The soft serve machine makes soft ice cream or frozen yogurt by mixing typically 30% to 40% air into the frozen dessert during the freezing process. Higher volume of air in the frozen dessert results in light texture, softer and creamer ice cream or frozen yogurt. On top of that, the soft serve desserts are served at a much warmer temperature (-4°C) than the regular ice cream (-15°C) which helps to enhance its flavor by minimizing cold burn. The credit of inventing soft serve machine is often given to either or both founders of Dairy Queen and founders of Carvel around late 1930s. 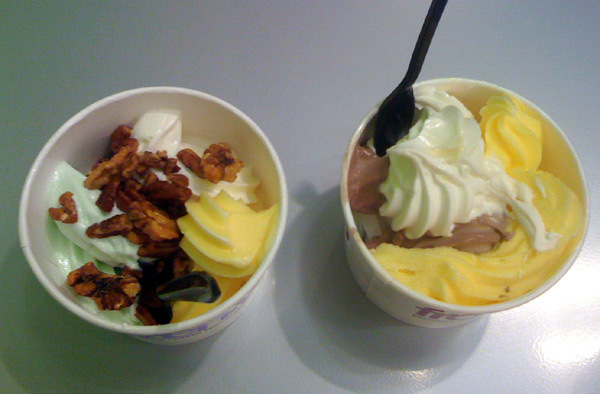 Frozen yogurt is similar to ice cream except it is made with yogurt rather than cream (thus ice cream). Frozen yogurt can be either served as somewhat tart original yogurt-like flavor or as something that taste exactly like ice cream. Many soft serve ice creams and frozen yogurts have generally lower milk-fat (3% to 6%) compared to ice cream (10% to 18%) because they already have creamy texture due to air. Interestingly, United Sates federal labeling standards require ice cream to contain at least 10% milk-fat and 20% milk solid. Frozen yogurts tasting like a regular yogurt are indeed healthier than the ice cream while the ones tasting just like ice cream are as healthy as, you guessed it, as ice cream. I have not tried all the flavors in FroZenYo. Among those tried, my favorites are macadamia, pistachio, and cheese cake. Others that I have tried are all decent. I was quite disappointed with only one flavor, mango. The mango flavor was very tart like a sour raw mango sorbet that didn’t have any milk. Since it was frozen mango yogurt, I was expecting the flavor profile similar to the mango ice cream, more sweet and less tart. However, some people prefer extreme tartness – to each their own. I suggested using small tasting cups to try beforehand if you are absolutely not sure about the flavor. After you get your frozen yogurt, make sure to leave some room for toppings. Go to the topping bar. 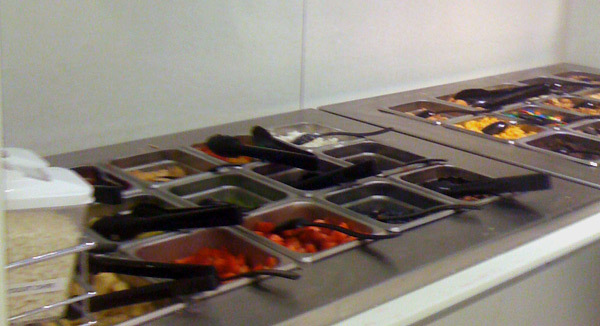 There are arrays of toppings you can choose from, such as regular fruit toppings, nuts, and chocolates bits. 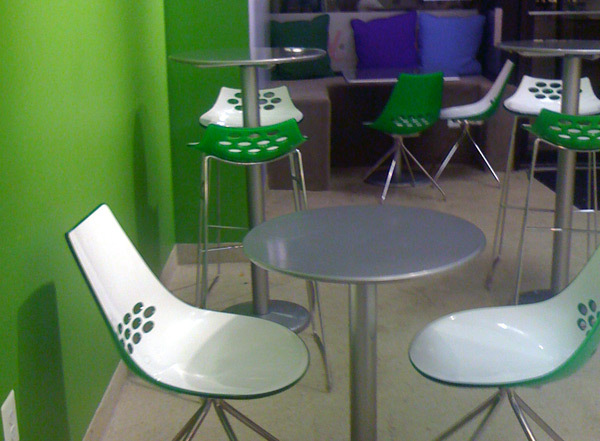 FroZenYo is an excellent choice for desserts for any occasions, with friends, family or date. No kidding, it may be one of the best first date idea. It’s inexpensive yet stylish, and the best part is you can learn about your dates by the flavors and toppings they pick.